Pitkin County Open Space and Trails is kicking off our Roaring Fork Gorge Management Plan process. 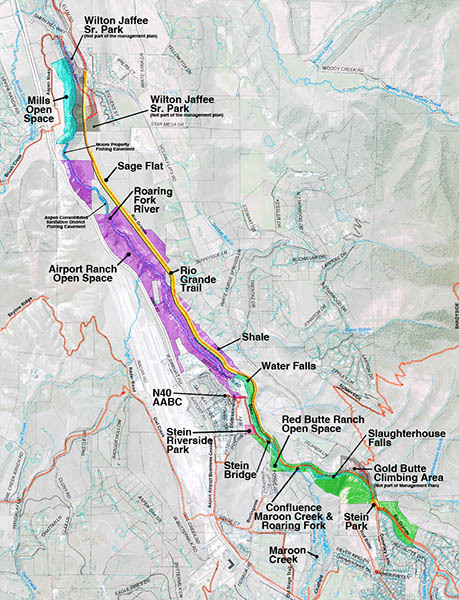 Six different Pitkin County Open Space properties on, around and including the Rio Grande Railroad corridor between Slaughterhouse Bridge and W/J Ranch are the focus of this comprehensive management planning effort. The properties to be included in the plan are: Red Butte Ranch, Airport Ranch, the Denver/Rio Grande Railroad corridor, Mills, Stein Park and Stein Riverside Park. After spending last year studying alternatives for a hard surface trail connection into Aspen, it became clear that before we could make the best decision for the trail, we needed more information about the properties surrounding it, trails connecting to it, and environmental and wildlife issues. The goal of the Gorge plan is to take a step back and take a comprehensive look at the whole area. We want to understand how you currently use the properties, how you access them, where you park, how you would like to use the properties in the future, and if your use would change if the properties were managed differently. A draft report will be publicized for further comment in late summer. The goal is for a final Roaring Fork Gorge Management Plan to be adopted in December 2013.